All of those programming courses you spent good tuition money on are for nothing if they didn’t include a class in C. Considered to be one of the most important programming languages, C is used in the majority of applications, tools, and hardware devices. And this world can be at your fingertips if you grab a copy of today’s discount software promotion, Learn To Program C! 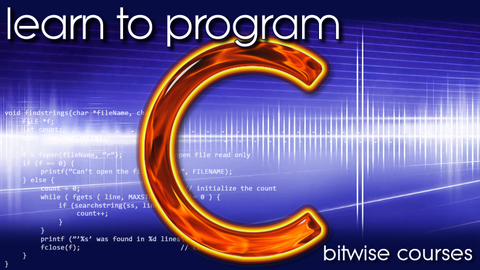 Learn To Program C teaches you the full spectrum of C programming, from the fundamentals all the way to more advanced topics. With Learn To Program C, you’ll be gaining insight and command over pointers, addresses, and file I/O operations. Before you know it, you’ll be on the road to qualifying for lucrative new work involving compilers, desktop applications, tools, and utilities! Although C can be difficult to learn, Learn To Program C takes you by the hand and assumes that you know nothing about the language. After a quick introduction, subsequent lessons do a deep dive into topics that include scoping rules and the relationship between arrays and memory addresses. So get a copy of Learn To Program C today and prepare to become the C Programming Guru! After you purchase Learn To Program C it may be used indefinitely. Learn To Program C is licensed per user, so if more people are going to use Learn To Program C you will need to purchase additional copies. Each license allows installation on all owned computers, but Learn To Program C may not be used at exactly the same time on each of them.